Anyone have a speedometer cable for a 58 b they want to sell? The cable inside mine is broken off inside the speedo head. The universal replacement cables are too small in diameter. I don't know about the R models. I know the "universal" repair cables you get from the parts stores are only to replace the cable inside the housing. That's what is too small in diameter. I think they are more for cars and pickup trucks. If I can get an old used one that isn't broken, that will be fine with me. Just an idea, but one of the local heavy duty truck garages in our area had the stuff to make cables. 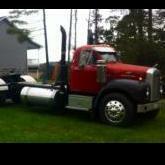 I remember them making one for my dads cabover KW many years ago. Maybe if you have an old shop in your area they could too.